HappyVille: Quest for Utopia is rated 2.9 out of 5 by 13. Rated 5 out of 5 by Lizzikiss42 from Happyville... Best game ever! It's a brilliant and lovely game! I loved this game and I would suggest everyone on Big Fish games looking for a great game to try it! Rated 4 out of 5 by GailPeng from Wonderful game with a big shortcoming It's indeed a very interesting and creative game. However, after you fullfill all the requirement, the game become endless. I will suggest to change the territory background or change the building style and dress of people in order to add more level of the game. Otherwise, after playing it for a couple of hours in a day, you will not want to play it again. Rated 4 out of 5 by Cheri_BDG from Slow and steady! This is definitely not the typical "time management" game. There is no rush, indeed if you try to meet the goals in the order they are given you'll quickly find yourself broke and desperate for income. I wish they had made the goals come a bit slower, unlocking new buildings slower as well, as being told to build a school for instance, so early in the game saps your income to nothing, and you'll spend forever waiting for money to roll in to grow you city further. I like that you are allowed to grow your city freely. Based just on the free trial I think this is a great game for anyone who likes city builders, and is interested in one with perhaps a little less complexity. Give this game a spin and decide if it is for you! Rated 4 out of 5 by abito_fortuna from A fun SIM game Graphics and audio are pretty good. Personally, the level of control over the game isn't as much as I like (as in can't move buildings around). However, the game is great fun overall. 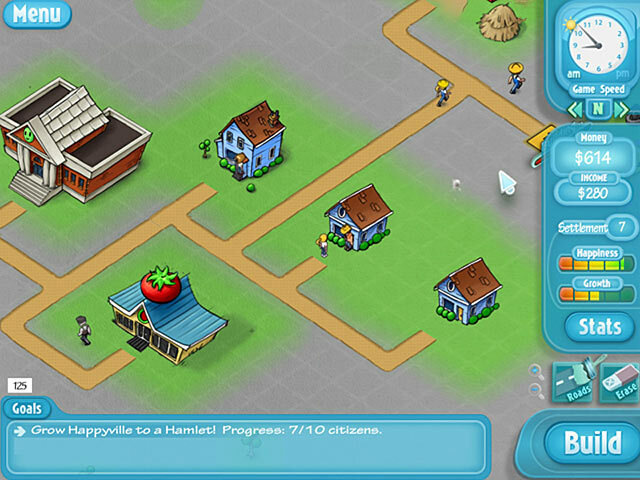 Rated 4 out of 5 by lininindy from Kind of like Cityville...Fun...but takes a little time. It was challenging to get the right building in place before elections. It was fun to decide what goes where and when. I LIKE BUILDING CITIES. This was done in my first free hour. Rated 3 out of 5 by hugsie from Not bad The game itself is not bad, though it is a bit too easy at times. It gets repetitive after a while and not enough businesses. It has potential, but needs upgrades. Rated 3 out of 5 by frifritzina from less than expected Really impossible to end this game! Rated 2 out of 5 by SavvyMom from Has Potential...but falls short This game has great potential but falls short on some important aspects. The graphics leave much to be desired. It's like the difference between playing Nintendo and Xbox. If you're old enough to know what a Nintendo is..you'll understand. Gameplay is "ok". You cannot rotate your houses. The stats tell you that you have unhappy citizens, but doens't tell you WHERE they are, and doesn't give you an option to locate them. The only way to tell is that the unhappy citizens are "grey" (don't have much color). If you have a large city, this is not acceptable. Overall, the game is simply "ok". I wouldn't waste money purchasing it, as their are much greater options. I didn't even finish the free trial. Rated 2 out of 5 by puppydogtails from Not At All A City Builder Replica I tried the trial game and thought o.k. this might be fun to expand the town, and of course bought it once it was a deep discount sale. I found this game to need many improvements. One, you can't turn the lots they only face one direction, unlike most city builder games where you can turn lots facing the roads etc. Also, many houses are only filled with one or two residents that never marry etc. O.k. you have very limited map space so this takes up more room. Also, the farms are huge and only employee one person and only feed ten. The goal is to grow your town to 200 people but with a farm only feeding ten of them and only one employee you can imagine how much space is used up by farms every ten people in the town. It would have been better to hire more on the farms. Unlike the municipal buildings like the town hall, or the schools, the businesses also only hire one person or no more than 2..waitress/cook etc. This would have been better to have 'improved' these buildings as time went on and you gained expertise and they only accomidate 3 houses whether that is vertical or horizonal in position near them..only three. Again this takes up a huge amount of space. If you build a house say between two others it may not have access to one of the businesses since they only accomidate the three closest ones. Flowers and shrubs aren't unlockable until late in the game and since you have already placed roads for your houses there isn't any place to plop down decorations unless you start erasing houses and streets to accomidate these new features then there will be the having to erase and rebuild the businesses again. I found it lacking on many levels, worth the very cheap price the other day just to try to get to 200 residents but by that time you have run out of room since most houses only house 1 or two people. Some have families as big as five or six but not many. And No multi family homes, either. Also, once you reach 200 residents they aren't capped off. 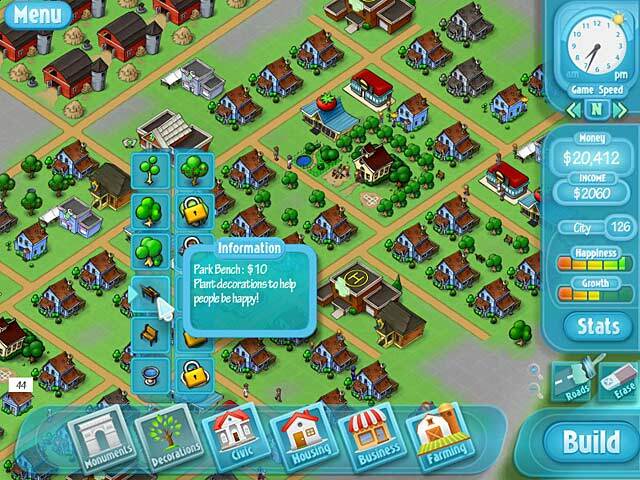 After that, the game requires you make everyone happy, that is impossilbe it seems since they keep coming and are homless and jobless..no more space to place bldgs. and if you are a good builder then you only hurt yourself in the long run if everyone has access to businesses and government bldgs then there are no more jobs to be had, since the businessess are built by the residents on demand or need. And if you increase #3# the employeess at schools and police depts. then this cuts down on the residents needing anything in the area but job. Which they aren't going to build anything since they have access to everything if you build it right but may have several unemployeed sad people or several homeless not only due to a lack of space to continue. You can't lose an election no matter how close, I tried. 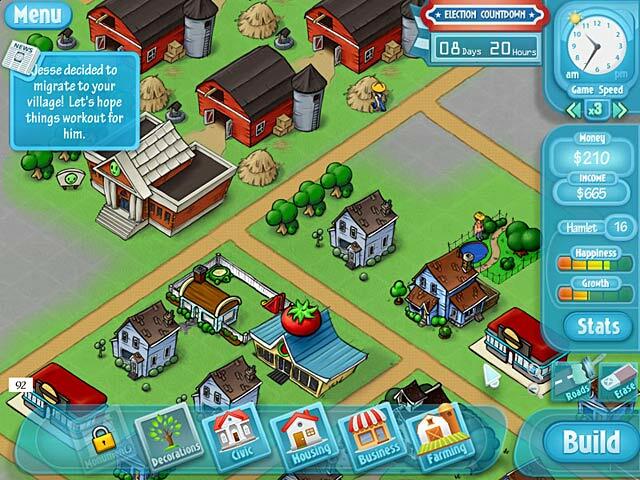 Even the old game Mall Tycoon allowed players to turn the houses or businesses in 360 degree direction which would save a great deal of space in this game. It was fun but needs improved on round two, if there is one.